Located in central Italy in the west of the Apennine mountain range (including the archipelago around Elba.) 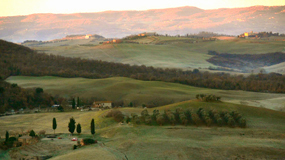 The gentle hilly and mountainous landscape of Tuscany adjoins the regions Emilia-Romagna in the north, Marches and Umbria in the east and Latio in the south. The coastline of the Liguria and the Tyrrhenian Sea extend for 350 km in the west of Tuscany. Total area 22,992 km2 (about 7.8% of the Italian territory), population 3.75 millions (about 6.5% of the total Italian population), subdivided into nine provinces: Arezzo, Florence, Grosseto, Livorno, Lucca, Massa-Carrara, Pisa, Pistoia and Siena. Capitol: Florence, approx. two-thirds of Tuscany is agricultural country (about 25%) and forest (40%), main rivers: Arno (240 km), Ombrone (160 km), Serchio (103 km). 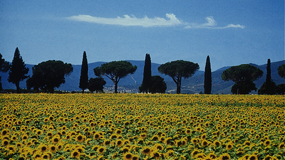 With more than 4 million visitors each year - thereof 40% foreigners - Tuscany is the major tourist region in Italy; the tourism sector displays an important source of income for the region. Tuscany belongs to the most important agricultural areas of Italy and is famous for its wine, olives and oil, edible mushrooms and the various cheese and sausage delicacies. An eminent centre of textile production is Prato. 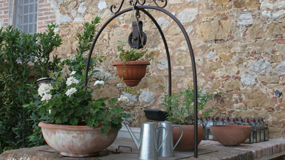 Florence is famous for its crafts and arts (jewellery, paper, ceramic, leather and basket ware). The central points for fishing are the seaports Livorno, Marina di Carrara, Piombino, Viareggio and Porto Santo Stefano. 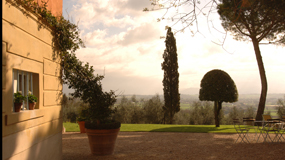 Tuscany is one of Europe´s famous vineyards. Besides the white wines of the Vernaccia, the region is famous for its red wines of the Chianti, Brunello di Montalcino or the Vino Nobile di Montepulciano. 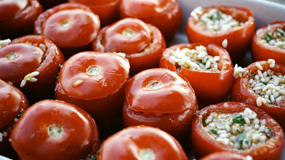 Another speciality is the sweet wine Vino Santo that is usually served as an appetizer or a dessert wine. Delicacies of the Tuscan cuisine: Bistecca alla Fiorentina (beef steak, grilled on the bone), Trippa alla Fiorentina (chitlings with tomato sauce), Pappardelle alle Lepre (pasta with hare sauce), Ribollita (soup with cabbage and other vegetables), Risotto nero (rice with seafood), Stoccafisso alla Livornese (stockfish, steamed in oil, wine and vegetables), Bruschette (roasted bread with garlic, oil and spread), Salsicce (sausage), Pecorino (feta cheese), Mozzarella di bufala (buffalo cheese), Cantucci (almond cookies). Mediterranean climate with hot and usually dry summers, whereas the winters can be rainy. Ideal travel time: spring and fall; especially recommendable is a visit in May, which is usually very sunny, yet not too hot. Pleasant temperatures also dominate September and October, but one should be aware of rain. At Easter time there are a lot of visitors and pilgrims in the cities. 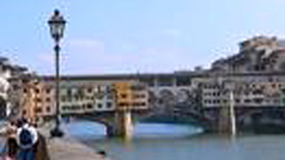 During the summer months July and August it is extremely hot in the cities and especially in Florence. The majority of the residents escape the heat and go on vacation to the sea. Numerous shops, restaurants and bars are closed during this time but the tourist attractions are still open and visited very well. By car: from the north on the chargeable highway via La Spezia or Bologna along the coast connection or via the central route A1 (Milan-Bologna-Rome) towards Florence; the historical centres of various cities are inaccessible to traffic (zona blu). By train: the main connection from the north is heading towards Florence; local tracks lead into all Tuscan provinces from there. International airports: Aeroporto Amerigo Vespucci /die Pretola (Florence), Aeroporto Galileo Galilei Pisa. Ferries to the Tuscan islands via the ports Livorno, Piombino and Porto Santo Stefano. Approximately 20% of the art treasures worldwide are located in Florence. Although today' s art metropolis did not play a major role from the ancient world until the 12th century. Primal in the 13th century the city at the Arno achieved economic success with trade and industry and especially with the fabrication of cloths. The enormous wealth of the beloved and also dreaded dynasty of the Medici was the basis for the Renaissance – the termination from the medieval system up to the return and the tie to the ideas of the Greek-Roman antiquity. Especially Lorenzo, called the glorious, had moved Florence to its cultural bloom. The lily-town became the centre of geniuses. What remains from the 300 year-old era of the Medici is the sheer unfailing richness of art treasures, literary works and architectural masterpieces. Just think about Michelangelo' s David, about the splendid comedy of Dante or about the Filippo Brunelleschi' s mighty cupola of the cathedral.